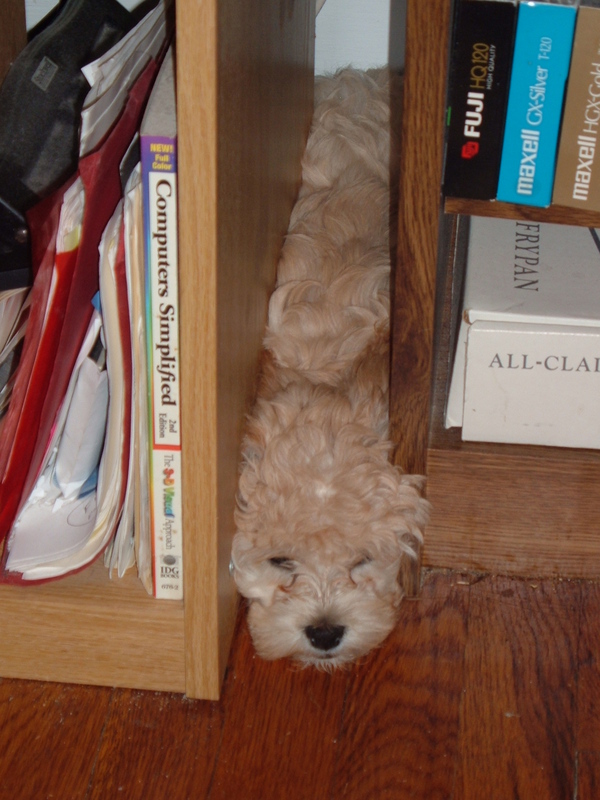 When I first got Cricket, as an eight week old puppy, I wanted to do everything right. I found books on how to choose a puppy, train a puppy, and groom a puppy, but it was all too generic. None of it addressed who Cricket actually was: the way she seemed to love the taste of the bitter apple spray I was supposed to put on the furniture to discourage chewing; the way she couldn’t calm down after even the smallest excitement; the way she stuffed herself between book cases for comfort. I needed to hear about actual dogs, and real people who were imperfect like me, but trying. 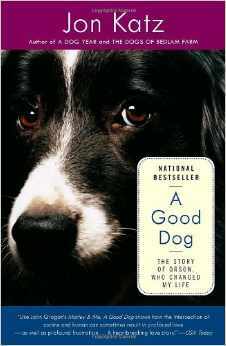 I found a book by Jon Katz called, “A Good Dog: the story of Orson who changed my life.” He’d adopted a Border Collie, from a breeder who’d had trouble finding the dog a home, and when he picked the dog up from the airport he found out why. What I loved about the book was that he was willing to admit how hard the lessons were to learn. He didn’t portray himself as a white washed ideal. He was a person who made mistakes, and tried hard, and came up against failure again and again. I’m a big fan of people who are willing to admit failure, and not always put on a happy face, because that’s what allows me, as a reader, to relax and not feel so judged for my own failures. Pam Houston writes fiction that she says is about 82% autobiographical. 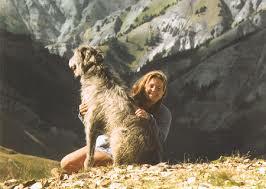 She wrote a novel called “Sight hound” about an Irish Wolfhound with cancer. I actually can’t remember what else the book was about because her portrayal of the dog was so rich that I tuned out the rest. This was a dog who was loved. And I felt like she was giving me permission to love my dogs that much too. I specifically read James Herriot’s collection of dog stories as a way to warm up for writing this blog two years ago. He was a country vet, and his writing style was so friendly and filled with humor and compassion, that he made me feel comfortable. I felt like he was painlessly teaching me bits and pieces about how to take care of animals, and treat them with respect, and he tossed in a few bits of insight about people too. I’ve been reading more of his work recently, and now I know more about a cow’s insides than I ever wanted to know. 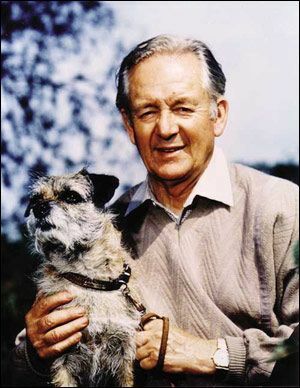 James Herriot and a dog with something more interesting to look at. Mark Doty’s memoir “Dog Years,” is a new favorite of mine. I’d read a couple of his poems, under duress, during graduate school, and while I could admire his skill, I was not tempted to read more. But I came across a picture of him with his dogs online and I thought, he can’t be that bad, and I decided to take a look at the memoir. I was afraid he would be pretentious, or his language would be heavy and convoluted, but he is a memoirist who speaks with a clear, articulate, and deeply empathetic voice. He illuminates grief. He has compassion for himself, for his dogs, and for me, by extension. 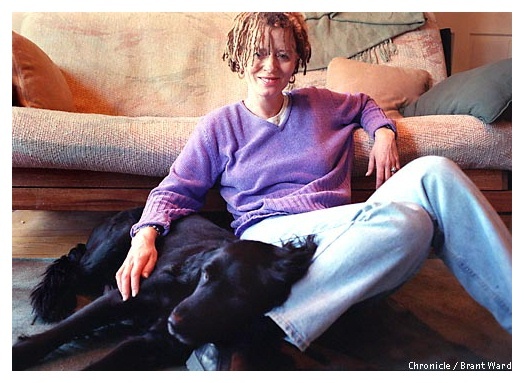 I wouldn’t want to tell someone to just read one or another of Anne Lamott’s memoirs. Read all of them. Go on line and read all of her one-off essays. Read her shopping lists if you can get your hands on them, because they’re probably hysterical. I’m always looking for more dog books, just like I obsessively read all of the dog blogs I can find. Any and all recommendations are welcome. Posted in dogs, memoir and tagged Anne Lamott, books, dogs, James Herriot, Jon Katz, Mark Doty, memoir, Pam Houston, pets, writers. Bookmark the permalink. Those Irish Wolfhounds are gorgeous aren’t they? Hi Rachel, you have commented and liked my blog. Thanks. My husband and I are now reading the book HOW DOGS THINK by Immanuel Birmelin. Let me know what you think. I’ll look for that, thank you! If you haven’t already, read Amazing Grace by Dan Dye and Mark Beckloff….the Three Dog Bakery guys. I will definitely look for that! Thank you! I’m reading about his early career now and I’m even more impressed with his humility and willingness to tell stories on himself, without shame. yes, he is amazing. Have you read All Creatures Great and Small by Herriot? It is wonderful. I think that’s the one I’m working on now. I do a chapter at a time, in between bouts of statistics homework. I loved this post, thank you. I also enjoy Jon Katz’s books and read every book Herriott (James Wight) ever wrote. I just finished a fun book of fiction, “The Dog That Talked to God”, Jim Kraus, that was very entertaining. Thank you! I’m trying to imagine Cricket talking to God. I worry there would be a lot of cursing. Any book by Patricia McConnell – The Other End of The Leash is one of my favorites. The Art of Racing in the Rain will make you cry, but it’s so good. Dean Koontz writes about his Golden Retriever, Trixie. Pat Miller writes training books – all about positive training, clicker training. (I read a lot of dog books, too) A Dog’s Purpose is one of the best, too, and that will make you cry, too. Hi Rachel! Thanks so much for visiting my Dusty Boots blog. I was wondering if you read Rachel Lucas’ blog? She’s bright, articulate and very funny, although sometimes she writes about serious things too. Rachel, who lives in Texas, has two adopted dogs (she doesn’t like the expression “rescued”), Primo and Fireflly, whom she adores and talks about all the time. She lived in Europe for a few years and adopted Primo from Italy. Her blog is at: http://www.rachellucas.com. She’s also on Facebook at rachellucas.com. Highly recommended! About books: Have you read Gary Paulsen’s “My life in dog years”, which is a series of mini-biographies about (obviously) all his dogs? You might also try James Thurber, “My life and hard times”, set in his childhood in the very early 20th century, which includes a story called “The dog that bit people” (and the rest of the stories are funny too). The Amazon link below shows Muggs (the dog that bit) on the cover). Thanks! I’ll definitely take a look at those! Oh dear, I didn’t mean to put an ad on your page! sorry! So glad you did though; I will be buying them both, thanks. Bitter apple furniture protection spray eh? We were recommended to try tabasco to stop our border collie stripping off the wallpaper. He liked it even more (sigh). Loved your post Rachel. 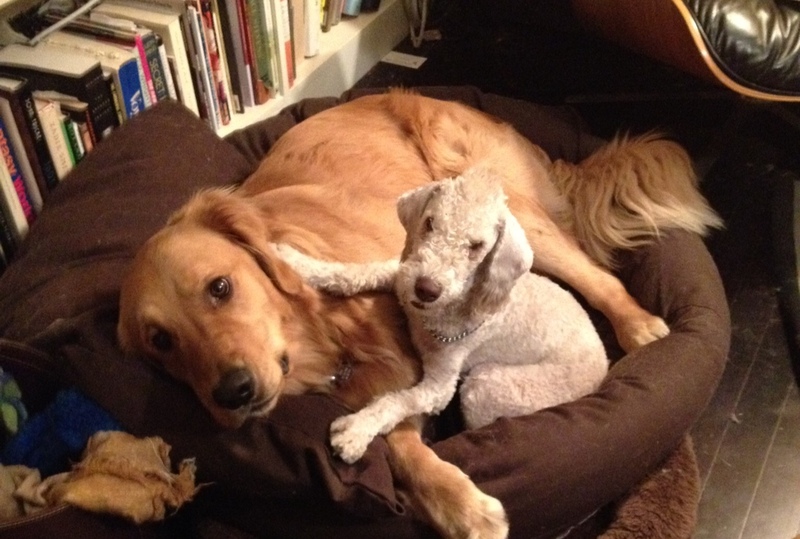 IMO the ‘How To……’ doggy books are all very well for the basics and ideas, but they see a dog, any dog, not yours. All dogs are all different. Marley and Me was a recommended read, and I cried. I also saw the film, which to me was not a patch on the book. The heart wrenching scene at the vet’s was too close for comfort as a reminder of how we lost our last dog, and I bawled my eyes out. We love our pets to distraction. They are part of our family, and leave a gaping hole when we lose them. We all make mistakes (one of our biggest is letting her get up on the bed at night! ), we just learn from them, and probably do the same thing with the next one. I wouldn’t be without them though. That vet scene in Marley and Me almost killed me. It was a hit or miss movie overall, but that scene came up and I went through all of my tissues and a couple of sleeves and a leg of my jeans. These puppies just bypass all of the protections we set up to protect us from other people. With you 100% on that. Mine is our Baby. Can’t help it, even if she can be a pain at times. She gives so much back and seems to know when we need that little bit of extra loving ourselves. You have to be a dog owner to understand how important they are in our lives. I completely know what you mean. So sorry for the typos in my first comment. Love all of these pictures – but that one with the bath must be one of the most adorable things I’ve ever seen! I think Cricket was trying to bring up as much Oxytocin in her people as possible when she was a baby – so we’d be completely bonded before she became crazy Cricket and we started to think twice. I loved James Herriot. I read and re-read his books. They were so good. His son is also a vet and considering writing a book. Thanks for the lovely post. I’ll have to check out the other books! It would be fascinating to see what his son’s experiences have been like, in contrast. I’m not strong enough to read books with an “unhappy” end :o) I read Boo! by Lisa Edwards a view times ago and I loved it :o) Have a super sunday! I read a puppy counting book at the doctor’s office the other day, and every time I turned a page, I worried the number of puppies would start to go down instead of up. Happy endings are the best! Little Miss Cricket made her teachers pull their hair out. She has taught me all about how to accept people as they are, and not create unreasonable expectations. Even when she’s an old lady, she’ll still be a handful. I’m resting up for the inevitable. We were told by one to return her to pound because of aggression. Now she’s a big cuddle puss, but still a naughty 2 yr old lol. They are worth the trouble. I was introduced to James Herriot many, many years ago and what a treat that has been. My favorite book is “The Art of Racing in the Rain.” It is written by the dog and is both joyous and tearful. Wonderful post, Rachel. Cricket is so adorable; your captions are hilarious! Cricket is so darn cute (even her name is cute). She reminds me a little bit of my first dog, Buffy, especially seeing the picture of her in the bag. 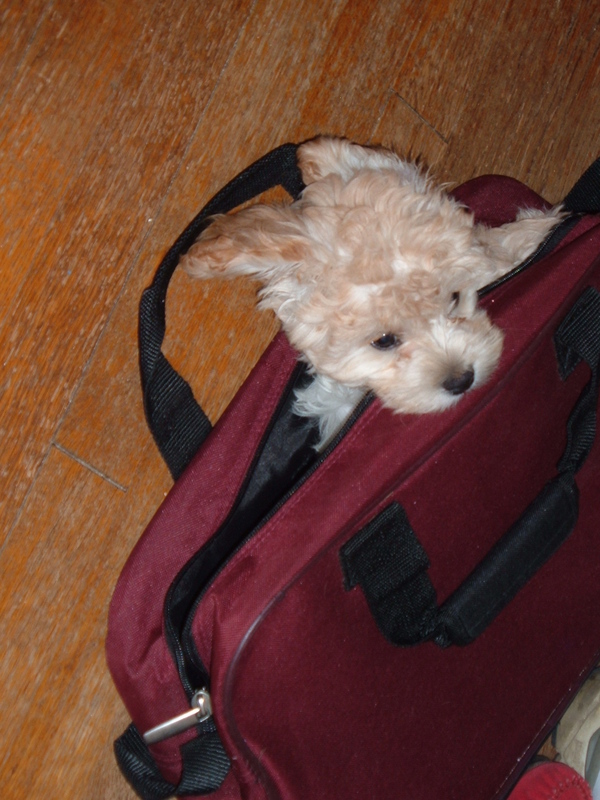 I used to take Buffy outside in a backpack so as to not get caught with her in my “no dogs allowed” apartment. Even when she no longer had to go outside via a hiding place, she still immediately crawled into any bag set down for her to crawl into, even if said bag was too small. She masterfully turned herself around at the bottom of the bag to put her head right-side up at the end of the move. She was a constant source of entertainment to others that were lucky enough to see her do this. I miss her so much, it still hurts, fourteen years after her passing. I actually carried Cricket around in a knitted bag when she was a baby when we had to do a long walk. She needed a water bottle and a cozy sleeping place and some snacks and paper towels and…quite a lot of stuff went into that bag. She loved to stick her head out of the top and say hello to people. If I tried to do that with her now she would leap out of the bag and stand on my shoulders and bark at people. These puppies, they really leave their mark. Oh, and thanks for your review and mention of all these great books/authors. I adore reading Pam Houston but have not read the others. I could use an IV full of Anne Lamott each morning, to smooth out the grumpies and get me on my way. How very nice you Liked my post Single Guys With Dogs. I guess one doesn’t have to be single to know that pets are our children. Surrounding a living thing with love, as you do with Cricket and all creatures, is wonderful. And sharing that with others soothes them. Keep up the love in all its forms! I’ll be looking out for some of these books. Thanks for the great post. 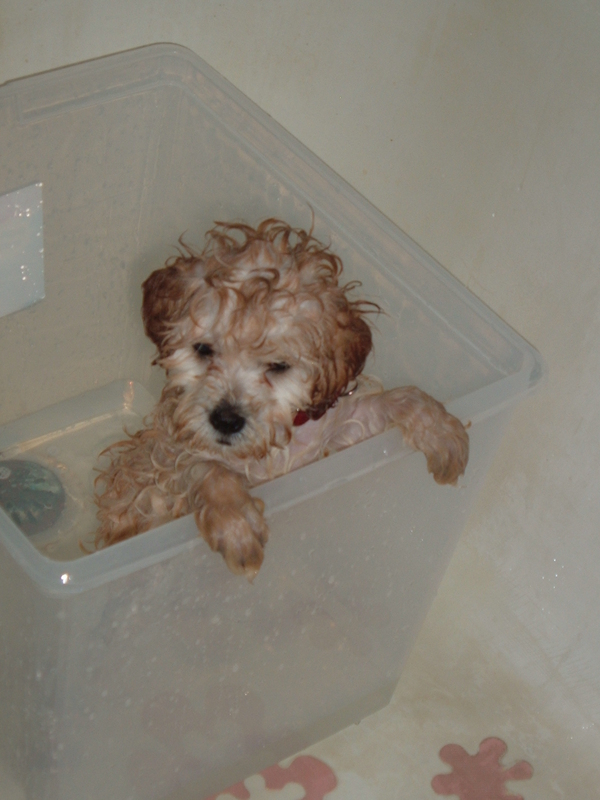 Oooh, do you have baby Bailey pictures?! He looks so much like Butterfly, it would be amazing to see him in all his puppy splendor! Excellent, great pointers, being Irish must find wolfhound book!!. You won’t regret anything Pam Houston. I might use this somewhere someday 😉 “I’m a big fan of people who are willing to admit failure, and not always put on a happy face, because that’s what allows me, as a reader, to relax and not feel so judged for my own failures.” Totally beautiful! Dogs, in my opinion, are such a valued members of the family unit. It scares me that mine are getting old (for Rotties they’re considered old, anyway). I don’t think I could ever live without a buddy/K9 kid. I think those of us without children are even closer to our dogs because they give you that mother-child relationship so many of us crave. People who say they don’t like animals, make me question why, unless they’re allergic, that’s a different story. Dogs are so innocent and loving. How could anyone not love them?! I totally agree. My girls are my babies. I’d do anything for them, which is a dangerous promise, because I think Cricket might be planning some crazy adventures for me. James Herriot…yes…everything he has ever written. Apart from James Herriot, who I adore and was brought up on – every sunday evening was spent sat watching the TV series – I’ve not read any of the others. But what a great list, I’ve noted them all! Thanks for sharing. I’m pretty sure that if I brought a book and the inevitable dogs to the beach, one or both dogs would eat the book. Jon Katz’s A Dog Year is a fav at our house. Do you like the later books? I know what you mean about all the different training methods. My brother has just got a Labradoodle pup for my nephew, and the family seem to spend most of their time arguing over how the new arrival should be trained. My mother suspects that my brother (a policeman) is using the police dog training manual, which seems a little over the top for a dear little ball of fluff like Max! I love James Herriot’s books. I think dogs, like kids, are all so different that you have to be willing to adapt the training to fit who they are – or else you, and the dog, are going to be very frustrated. That being said, that little ball of fluff is going to get much bigger soon. Maybe he could just go to school with his human brother? I think Max’s human brother would love Max to go to school with him! Which means, you have great taste! I’ll definitely look for that, though Cricket would argue with the idea that my guilt at leaving her alone is misplaced. The look she gives me, from under her couch, as I try to leave the apartment without her, is all about producing guilt. Love Jon Katz and Anne Lamott. She’s three parts fluff, one part dog. When she gets her hair cut, she’s a very small dog! When poor little Butterfly takes a bath she looks like she has the head of a chihuahua, attached to a little bull dog. I’ve tried to read to the girls, but they don’t sit still. They prefer watching TV. I love all the books you mention. Have you read Jimmy Stewart’s poem “A Dog Named Beau”? There is a YouTube video of him reading it on Johnny Carson. So moving.